A few months ago I stumbled upon an awesome introductory video course for Bitcoin by Ravinder Deol (see image to your left). The course covers all of the Bitcoin basics you’ll ever need. It will basically make you a Bitcoin expert in 7 hours of video tutorials, and no prior experience is needed. 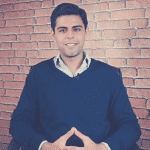 Ravinder is an award winner entrepreneur who is currently teaching over 8,000 students on Udemy. His Bitcoin for Beginners course has received over fifty 5-star reviews with an average rating of 4.96 out of 5. 10,000 Bits absolutely free (equivalent to 0.01BTC). The course is priced at $147 But since you’re now a member of “My Dirty Little Bitcoin Secrets” I’ve struck a deal so you can get it for only $20, if you act now.